What is MayNoWriMo? A writing challenge for one month. Where? A temporary yahoo group set up specifically for this challenge. The group will be disbanded in June–no long term commitments. Guest authors will be posting on their blogs throughout the month with the intent to motivate, encourage, and inspire! Why? Maybe you have a deadline. Maybe you need a push to finish the current book. Maybe you dread having the kids home all summer and need a headstart on a new project. Maybe you want to win a prize. Wait, did I say prizes? Yes! Everyone who completes MayNoWriMo will be entered to win some fabulous prizes (below). I’m sure the first question you’re asking is: Do I have to write 50K in one month? The answer is: no! 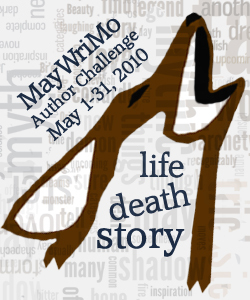 MayNoWriMo is about setting a challenging goal FOR YOU. You can revise an old project, continue an existing draft, whatever goals you need to accomplish in May. The goal should be challenging for you — but you don’t have to write 50K. If your goal is to complete a partial and submit by the end of the month or revise last year’s NaNoWriMo novel, go for it! Fun activities planned through the month include word wars and guest authors to help inspire and motivate you! Set a personal yet challenging goal. Part of the fun of NaNoWriMo is the “impossibility” of the challenge. Make it tough — but attainable — for you! The goal must be measurable (so I can easily determine who “wins” MayNoWriMo and can enter you in the prize pool). e.g. Revise 100 pages, write x words, or submit y queries on Project X. Or a combination of goals. Join the yahoo group when it opens. Participate as time allows: chat, encourage, motivate — there are all sorts of positive side effects from this kind of challenge. Take advantage of the group synergy to help you succeed! Report your progress after May 31st to be entered in the prize pool. Regular progress reports are encouraged but not required. Once a week, small prizes will be awarded, drawn from the participants who made a progress report. A writing craft or research “book wish” up to $30 donated by Joely Sue Burkhart. Critique of a partial (first three chapters plus a synopsis for MayNoWriMo novel only) offered by Deena Fisher of Drollerie Press. One-page critique of a partial (first three chapters of MayNoWriMo novel only) offered by Alissa Davis of Carina Press. Download of one e-book donated by Joely Sue Burkhart. 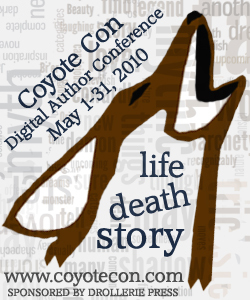 Download of one e-book donated by Leslie Dicken. Signed print copy of BEAUTY TEMPTS THE BEAST donated by Leslie Dicken. Now taking slots. Authors, contact me and I’ll list you here and get you scheduled. Ceri, if you’d like to sign up as a sponsor or guest, just e-mail me (joelysueburkhart AT gmail DOT com). I’m working on getting the challenge participant yahoo group set up now — so stay tuned! I’ll update this page with the link once the group is live. Membership is now pending for the yahoo group MayNoWriMo. Looking forward to challenging myself. Wow, Francine, you’re fast! Let me get a few more things finalized and I’ll approve you. Nadia Lee :: Paranormal Romance Writer » Blog » Hello, Month of May!